Groovy is a AngularJs music app template. 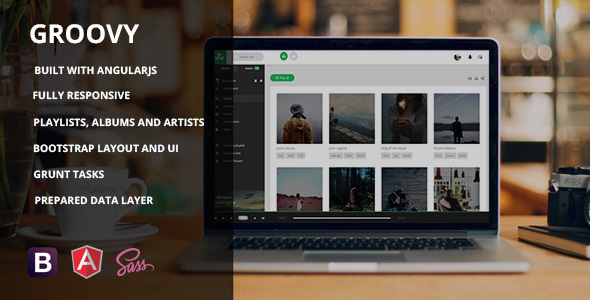 Built using AngularJs and Bootstrap it provides a fully usable music app with user’s playlist functionality, Albums, Artists, users profile pages, sign in pages, front page and a lot more. Groovy is built to be adapted to your needs and data is fetched already using HTTP request simulating a cloud based environment, all you need to change is the endpoint for where to get the data from. Just point to your server and your done! The theme uses Bootstrap so its easy to customize, using all best practices of good sass for building css (SMACSS). It also comes with Grunt and bower for managing dependencies.